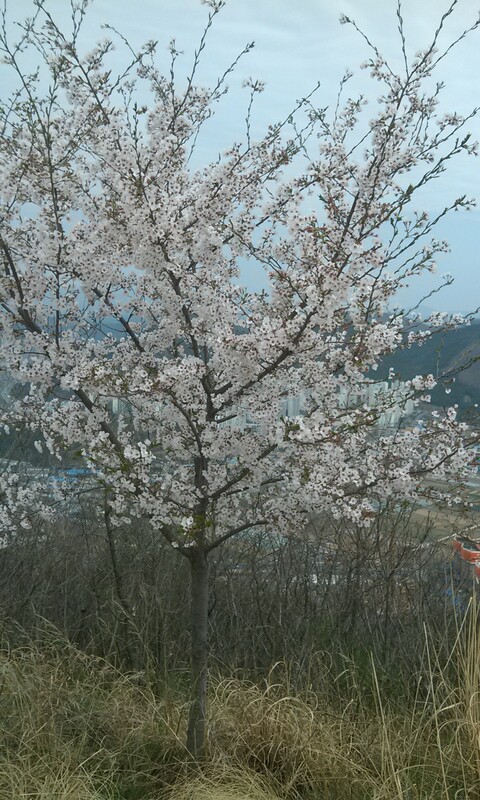 Last weekend we were planning to go to Busan for the day on Saturday. Busan is the second largest city in Korea and it’s only 45 minutes away by high-speed train or 1.5 hours on the slow train. As Saturday approached, we looked at the forecast and realized that it was going to rain heavily starting Saturday afternoon. The appeal of Busan is that it’s on the coast with nice beaches and rocky coastlines, so being outside is essential to enjoying Busan. We knew that by the time we made it down there we’d only have a short time before the rain hit, so we decided to postpone until a nicer weekend. Annoyingly, when we woke up on Saturday morning, it was stunningly beautiful outside. (This was only annoying because we’d cancelled our plans for bad weathe). It was cool and crisp and the sky was totally clear and blue. I decided to go for a run late Saturday morning to soak in the sun while it was still there. 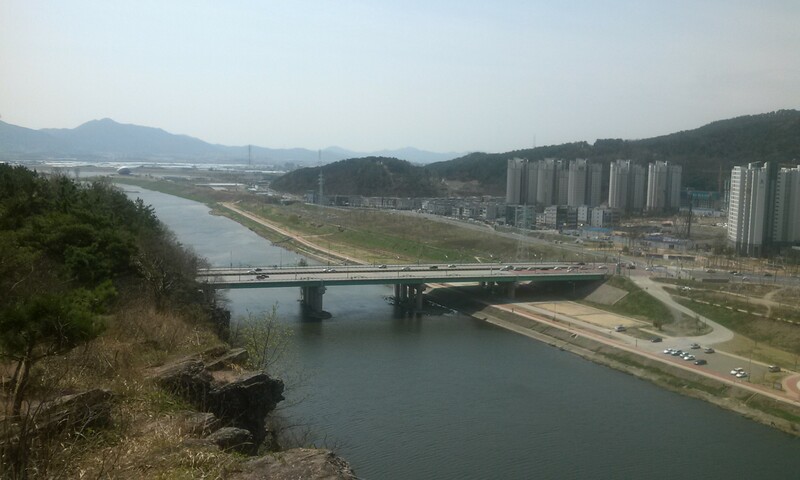 I went to my usual weekend running spot – some biking/running/walking tracks along the river on the west side of Daegu. It takes about 40 minutes to get there from my apartment, which is why I only go on the weekends, but I really like this area. 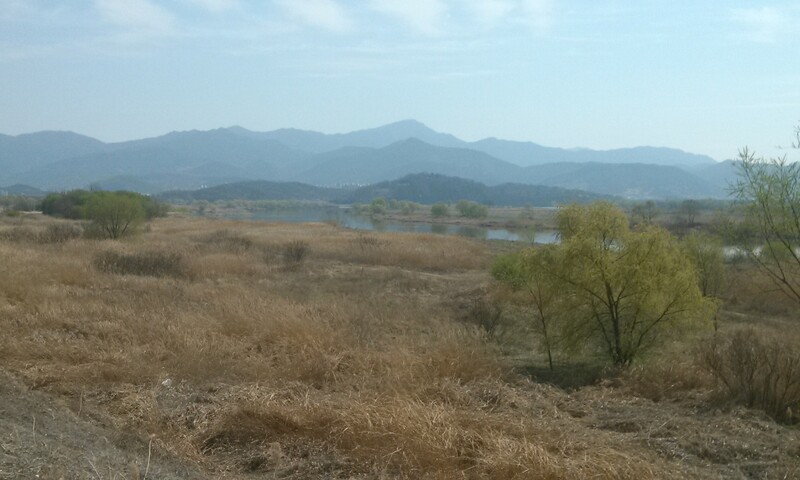 View from my normal running track. When I got to the river I decided to cross the bridge and run on the opposite side of the river from where I usually run. When I got halfway across the bridge, I glanced back the way I had come and noticed that there were steps cut into the hill (mountain?) behind me. I only thought about it for a split second, then turned around and got off the bridge to explore. Hill/mountain I saw a path on from the bridge. I started climbing and pretty quickly found myself up above my usual running path looking down on the river and the bridge below. (Sorry about the crappy photos, by the way. I wasn’t planning on hiking so I only had my phone with me and the camera on my phone just isn’t great). The bridge I was on when I spotted the path. You can see the track down below where I was planning on running before I got distracted. 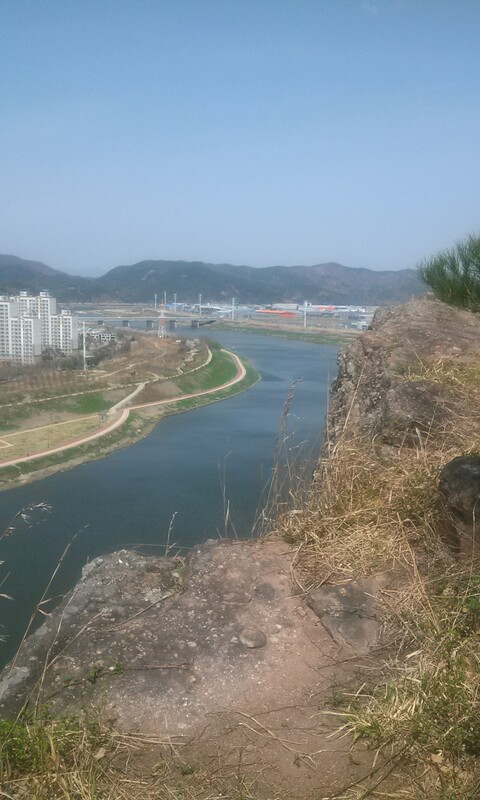 Once I made it up above the river, I realized that the path kept going. In fact, there were numbered posts ever 100 meters or so along the trail. The post at the head of the trail was #34 (I think) and when I reached the first “peak” it was still in the 20’s so I knew there was still a lot of trail ahead. I didn’t know where the trail would lead, but I figured it would eventually take me back down and I could figure it out where I was from there. I pressed on. 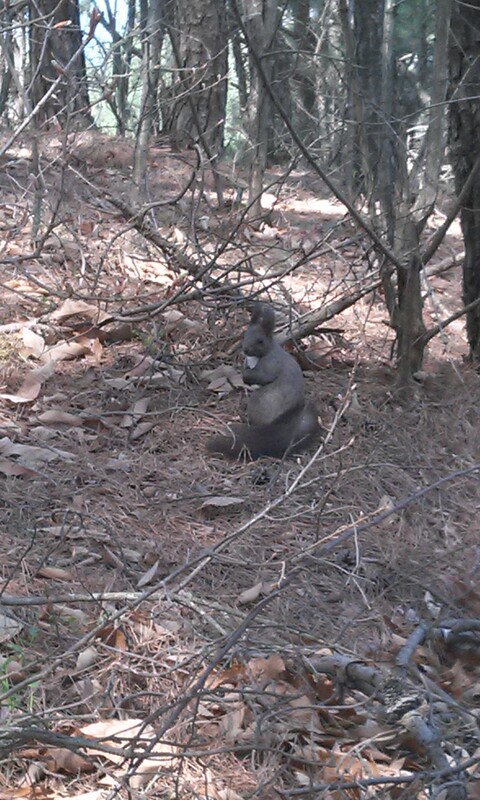 I met this animal which I think was a kind of squirrel, but it had some strange rabbit-like characteristics, too, so I have decided to call it a squabbit. 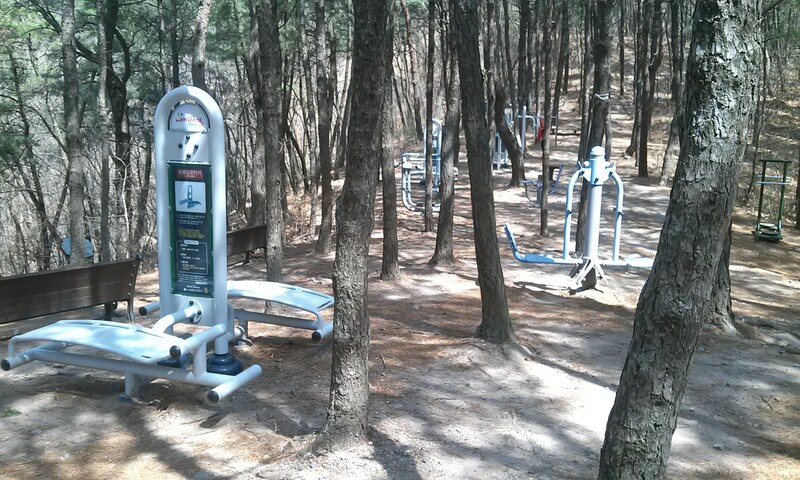 About halfway through the trail, I came upon one of the ubiquitous Korean outdoor gyms. These things are everywhere. 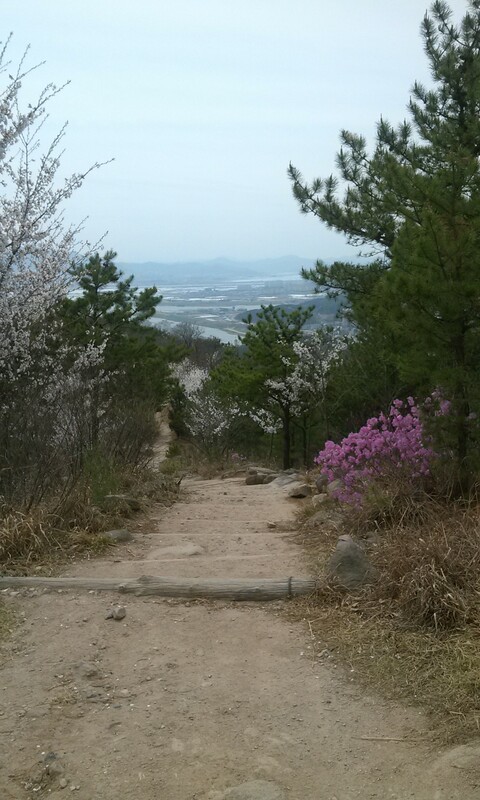 A funny thing about Koreans is that they are really interested in exercise and physical activity – hence all the hiking and gyms – but they are not interested in working out all that hard. I have almost never seen someone working up a sweat or doing anything strenuous. They will just use the equipment with no weight on it to casually do arm or leg exercises, but mostly they are just stretching and getting the blood pumping, often in very funny ways. It’s not unusual for me to walk through the park and see a man in his sixties hanging upside down from his knees on the exercise equipment to stretch his back. I encountered two more sets of gym equipment further on my hike. The first gym I stumbled on. I also found several of these hanging on trees near gym equipment. 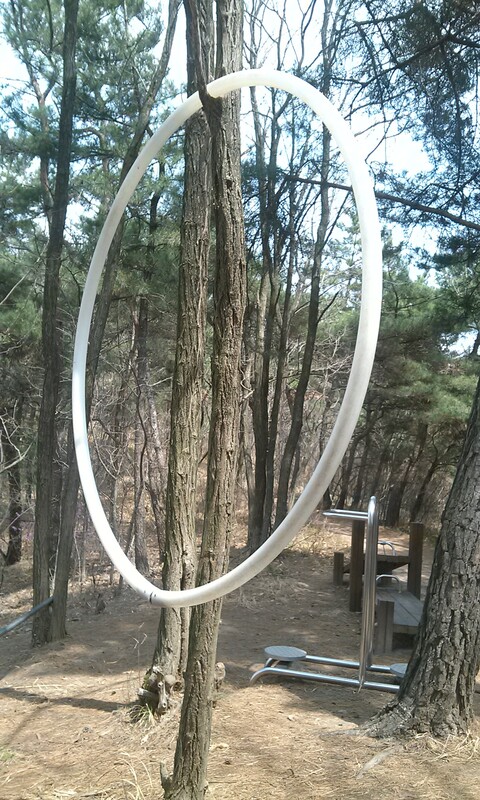 I can only guess it is some sort of giant hula hoop. I would have loved to see someone use it. It’s still early spring here, so there weren’t tons of flowers or trees blooming, but I did stumble on a few bits of unexpected beauty. The cherry blossoms are out in full force. As you can see, the sky was already starting to cloud up by this point. After about an hour of uphills and downhills and back uphill again, I came to the highest part of this mountain and took in the view. The trail continued on going back down, so instead of turning around I continued to follow it. 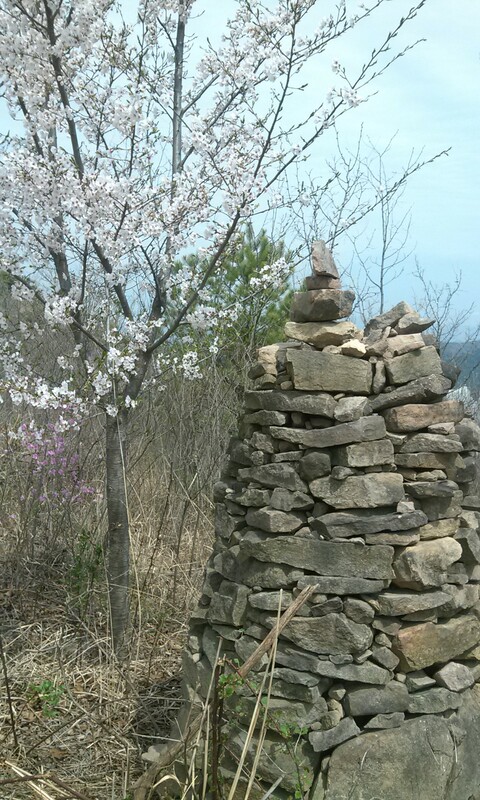 Along the descent I passed several stone piles like this one, which are typically seen on the path up to temples that are built high on mountains. I’m not sure why they were here in this case, but the idea is that people add to the stack as they pass by. About half an hour later I made it back down to the bottom, though in a different place than where I’d started. 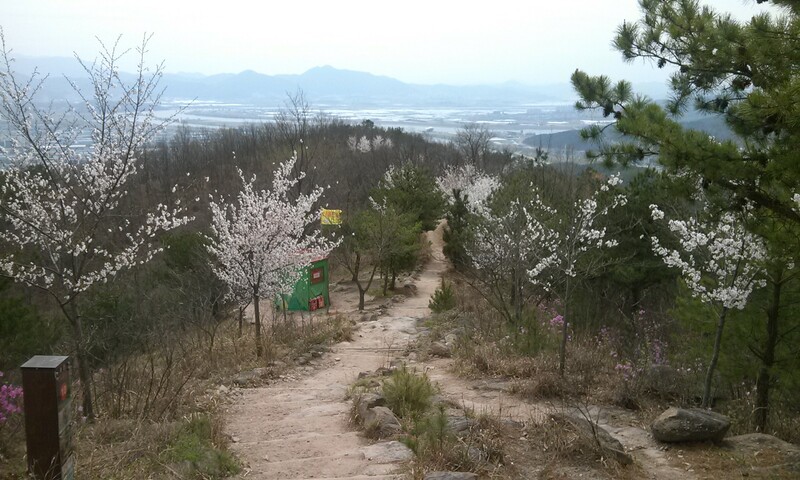 And, lest we forget that I am in Korea, here is a picture of what the bottom of the trail looked like, haha. This week’s adventure was about what my friend Meredith calls “unplanned loveliness.” It was about being willing to get lost – to wander with no agenda – to take the time to see the world around me instead of always being on a schedule. This adventure was about what can happen when you just say “yes” to what’s in front of you instead of thinking of all the reasons to say “no.” There is beauty all around us. All we have to do is take the time to notice it. PS – Happy Easter, everyone! If you have an adventure to share, add your link to the link-up by clicking the button below. You can also click this button to read other bloggers’ adventures. You can participate in all of the adventures or you can just do a few – no pressure. If you missed last week’s adventure you can find it here. And if you are new to my Fifty-Two Weeks of Adventure project you can find out more about it here. It really is great to just follow your inklings, isn’t it? And I thought the pictures were great! This morning I read a post from a book-reviewing blogger I really enjoy. It’s a book about spontaneity! There’s a theme in my reading today 🙂 I think you’d appreciate her book reviews. Oh, cool! I love when I run into similar themes in different places. Send me a link to that blogger! 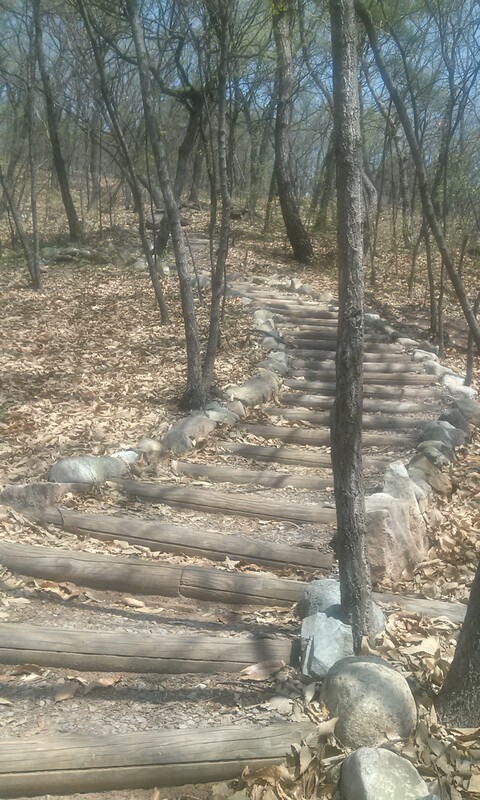 Looks great, we will be in Busan in a few weeks, may have to hunt down this trail! 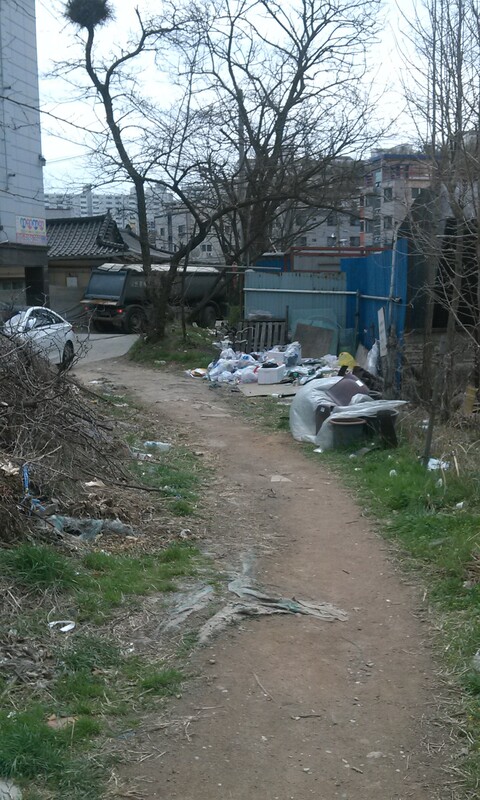 Actually, this trail wasn’t in Busan, it was in Daegu where we live. We didn’t make it to Busan that day because of the incoming rain. 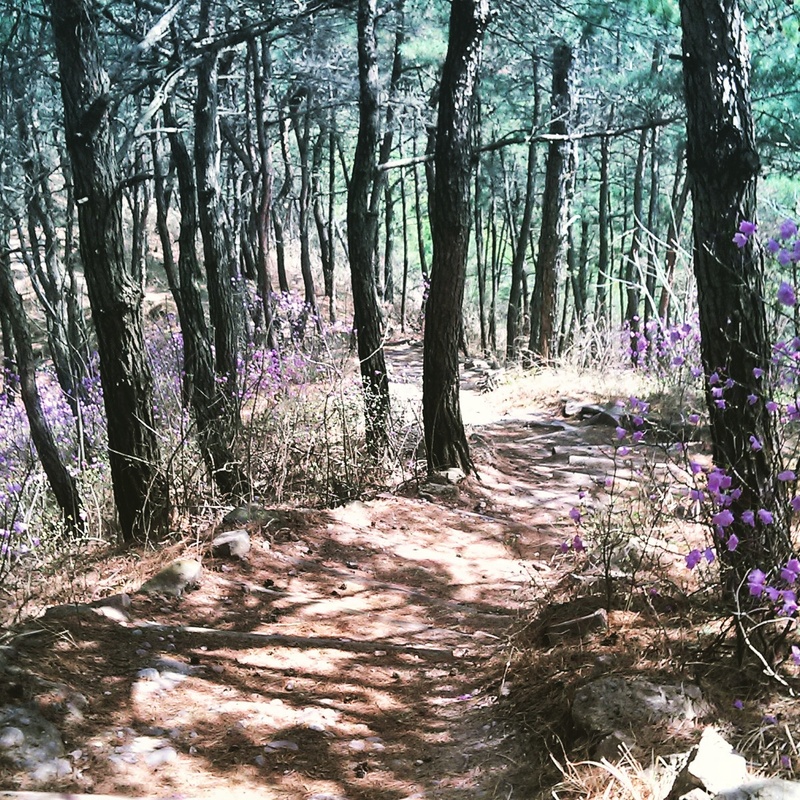 If you are going to Busan though I have two really good recommendations – the lighthouse that I wrote about at the end of this post https://twosorethumbs.wordpress.com/2014/05/18/my-parents-visit-to-korea-in-which-i-almost-become-a-human-kite/ and the temple by the sea that I showed in this post https://twosorethumbs.wordpress.com/2013/12/29/meanwhile-in-korea-what-weve-been-up-to-while-youve-been-doing-your-holiday-stuff/ Hope you have a great visit! Those trails look awesome. My husband would find a way to be there all the time. 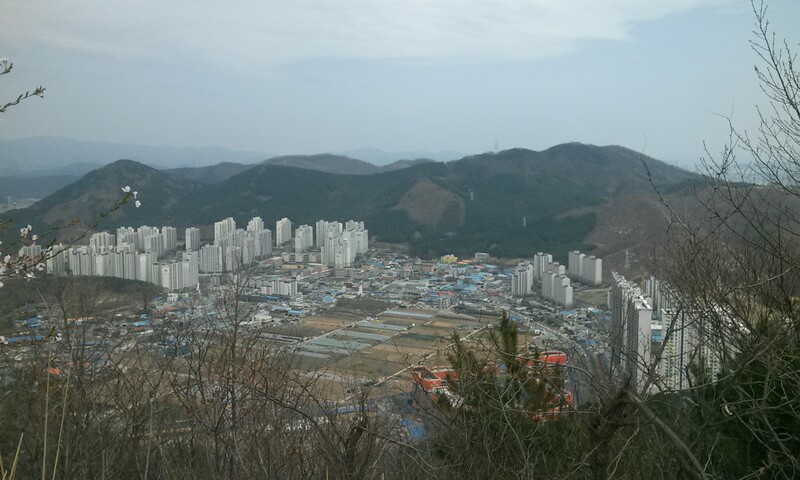 That’s something I really enjoy about Korea – there are mountains everywhere and nearly every mountain has trails on it if you can just find where they start! I love the whole idea of just walking where the trail takes you and seeing what unfolds. I am currently on a blogging adventure doing the April A-Z Blogging Challenge. It’s school holidays here so the kids are home and so I’m trying to juggle things. These posts seem to be taking longer than the usual. You might be interested to check out my Easter post which includes links to Easter customs around the world. Hope and your husband had a fabulous Easter and didn’t feel too homesick! Thanks, Rowena. I would love to check out your Easter post. The A-Z challenge sounds like a great way to keep yourself accountable to writing. 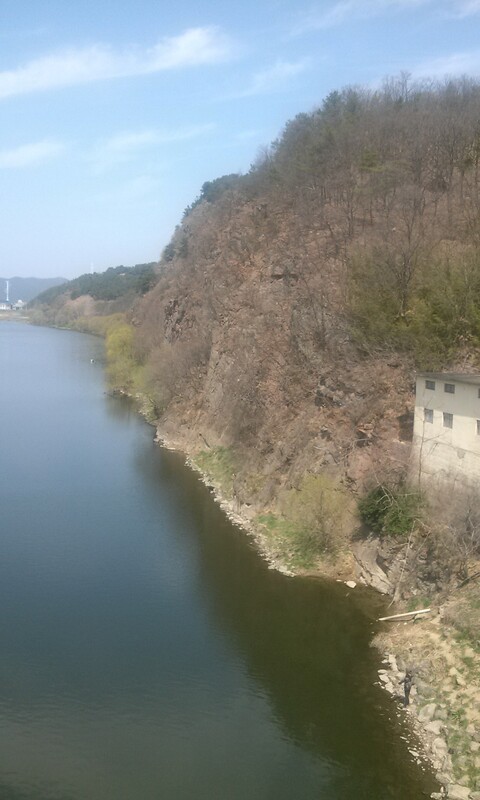 We did have a nice Easter with the house church we attend here – we spent the day with the people we are closest to here in Korea, so even though we were far from family and other friends we were still celebrating with people we care about and that helped so much. 🙂 Hope yours was wonderful as well! I feel bad because we missed Church. We turned up for the 4.00PM service but I thought it wasn’t on even though there wasn’t a message on the web site. We’re on holidays and it can be a bit tricky finding a service. Jesus is with us everyday and it’s that daily walk which is more important than just turning up Easter and Christmas but I could work on that as well. Take care! Good job there! Isn’t it just awesome when something lovely suddenly comes along to alleviate our pain/anxiety/stress… It just makes all the rest look so small and futile! Yes, it really was such a therapeutic thing – just taking time where I wasn’t wrestling with all the things that need to be done or all the stress that distracts me. It was much needed.